Dr. Brett L. Ferdinand is a surgeon and the author of Canada's most successful guide for the Medical College Admissions Test - "The Gold Standard MCAT For Medical School Admissions." He is also the only surgeon who devotes a significant part of his time to "helping students become doctors." In fact Dr. Ferdinand has been helping students become doctors since he taught his first prep course in 1987. The Author Of Four Books! A Pioneer In Online Prep! www.mcat-prep.com - The most comprehensive online MCAT Prep program in North America. We are very proud to have him as the instructor for our live MCAT programs. A Fantastic Opportunity From Dr. Ferdinand And Prep.com. This opportunity will combine the very best of Dr. Ferdinand's live program and his online program and it comes in 3 different options. A Live Weekend With Dr. Ferdinand - $495 Materials Included! Saturday - 8:00 a.m. - 6:00 p.m.
Sunday - 9:30 a.m. - 6:00 p.m. These two incredibly action packed days will feature the very best of Dr. Ferdinand. The weekend will combine his legendary "MCAT Science Review" with tips for how to identify the correct answers in the multiple choice context. He will provide focused guidance for the verbal section and a clear plan of attack for the Writing Sample. - who is the author of Canada's leading MCAT prep guides? The best part is the tuition fee. The fee for the live weekend is $495 which includes a copy of the American Edition of Dr. Ferdinand's Gold Standard For Medical School Admissions, in class handouts and the Gold Standard 2009 Edition Deck of Flashcards. Although pre-registration is required, the fee does not have to be paid until the morning the course begins. Start Your MCAT PREP Right Away! Dr. Ferdinand Online + Dr. Ferdinand Live - Full Immersion Prep in one full week! - $2095 - Materials Included! We suggest that you visit www.mcat-prep.com. You will be able to take a tour of Dr. Ferdinand's online program. You will notice that the pricing is in U.S. dollars and that the approximate cost of the complete program is approximately $2000 Canadian dollars. Through a special arrangement with Richardson - prep.com the complete program at mcat-prep.com (not including the DVDs- they are not needed because of the streaming videos) is available at the once-in-a-lifetime price of $2095 Canadian. This includes full immersion MCAT Prep, individual attention, learn how to "think" like the examiners so you can achieve your ideal score. Day 1 to 5 is from 9 am to 5 pm. Days 6 and 7 will present students with new content as described in Option 1 above. Each day is taught by Dr. Ferdinand and includes teaching the MCAT from A to Z, problem solving sessions using material that you have not been exposed to and many interactive sessions providing all the answers to your questions from an MCAT expert. In the world of MCAT test prep - it simply doesn't get any better than this. Course Materials include the 2008 Edition Gold Standard textbook, brand new Flashcards, audio MP3 and in class hand-outs. The online program can be started immediately but the complete $2095 course fee must be paid in full prior to receiving access to the program. Please include your name, address and telephone number (make sure the number has a voice mail or answering machine). 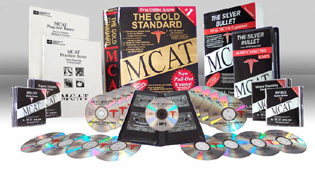 You get 16 MCAT DVDs of clear teaching + Flashcards + an MCAT audio MP3 + 2 best selling MCAT books including The Gold Standard (2008 Ed.) + 3 online practice MCAT CBTs, answers, explanations = a Complete Home Study Course! $399 US (you save over $200 CDN) Free shipping within Canada and continental US. Pay securely by VISA, M/C, Amex or Paypal. Copyright © John Richardson 2007, all rights reserved.